How HABA’s business savvy has kept the company afloat. TDmonthly Magazine first spoke with Lea Culliton, President of HABA USA, in 2005. In a recent interview, Culliton stressed the importance of brand-management and tech-savvy business moves. “The entire industry is in fast-change mode and what worked yesterday may well not work tomorrow. The online distribution channel is now one of the critical markets that can make and/or break a brand,” Culliton told TDmonthly. Q: How has your company changed since we last spoke? A: Our sales reached their highest peak in 2008, when all of the recalls were going on with China-made products and consumers were more interested in items made in German. The economy began its tumultuous downturn in fourth quarter 2008, and HABA sales suffered along with the rest of the specialty brands. HABA continues to be sold into specialty, but we’ve had to accommodate with pricing adjustments and programs. HABA has been part of the changeover in the bookstores with Barnes and Noble … most recently, HABA has obtained presence in the outdoor market with our Terra Kids science items being placed into the Gander Mountain stores. 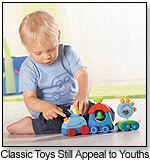 Q: Do you think that Americans are more open to the European style of HABA products than they were in 2005? A: I think the European style has always provided an attractive alternative to the Asian- and/or American-designed products. We have introduced new, vibrant, bold colors into our wood and fabric assortments, and the primary colors still sell well… the European influence of “my grandma had a toy just like this” can still be heard. Q: Have new standards in toy testing and regulation affected your company? A: Definitely. HABA was forced to reduce the number and selection of SKUs and categories we import into the USA based on forecasted sales volumes ratio to the cost of testing. We severely cut back on our children’s room décor and furniture category, totally removed our jewelry category even though the wooden jewelry would easily pass the tests; the costs were prohibitive across so many SKUs. Our products already met and/or surpassed the lead and phthalate restrictions. Q: In 2004, HABA products were sold in specialty stores only. Is that still the case? Why? A: HABA is still sold in specialty stores. We’ve had significant interest from stores that I would classify as “mass” market. However, due to the fact that our wooden items are still manufactured in Germany with a significant amount of human involvement, the availability in stock levels and the pricing is an obstacle for entering the mass-market venue. Q: What advice would you give to someone trying to break into the US toy industry? A: Do your homework. Depending on the products, I would definitely recommend that they join ASTRA and/or TIA and start making connections. The entire industry is in fast-change mode and what worked yesterday may well not work tomorrow. The online distribution channel is now one of the critical markets that can make and/or break a brand. Q: How have you utilized social media and online resources to improve business and your brand? A: From the industry standpoint, HABA has obviously taken full advantage of Toydirectory.com and the videos that you offer. We just started a Facebook page…It's a great way to communicate directly to the consumer, but it doesn't do any good if they can't find your product easily online or in stores. From more of the consumer standpoint, I think about where the products are meant to be purchased. Several specialty brands were harmed by not establishing MAP price points (Minimum Advertised Price) and standing by them, and making online retailers abide by them. Online stores were buying a product for $10, then selling it for $12 instead of $20. That online control of who your retailer is, and who's selling your brand online, has become really critical since the number of specialty retailers has declined. A lot of [.com businesses] aren't savvy and aren't using the right price points and it erodes your brand. Q: Do you think new high-tech toys, like electronic play laptops for toddlers, or even iPad apps for young children, pose a threat to more traditional toys like those that HABA produces? A: Five to 10 years ago kids might have been playing with classic wooden toys until seven years old, but I think the age keeps decreasing because parents, especially younger parents, are more inclined to give their kids an iPhone or iPad to play with in the car instead of a traditional toy. The window we have for children to play with traditional toys gets smaller and smaller. We offer educational value in our toys, so if mom and dad see that it's not just a toy for entertainment, but it also offers an educational facet, they'll be more likely to give it to their child. You can see toys HABA USA/HABERMAAS CORP. has shared with TDmonthly below. Sorting Box Animals by HABA USA/HABERMAASS CORP. Pure Nature Organic Line - Guardian Angels Toni and Tine by HABA USA/HABERMAASS CORP. Pure Nature Organic Line- Cuddlekin Cotti by HABA USA/HABERMAASS CORP. Pure Nature Organic Line - Soothing Sheep Cotti by HABA USA/HABERMAASS CORP.
My Very First Games - Feeling & Touching by HABA USA/HABERMAASS CORP.
Bingo Animal Kids by HABA USA/HABERMAASS CORP. The fox and little sheep meet with all the other animal kids to play together. Four animal kids always meet on a picture card. With a bit of luck you are the quickest and the first to find the animals of your picture card thus winning the game. An assigning game with animals for 1-6 children age 2+. Includes variation for older players. Swing Aircraft by HABA USA/HABERMAASS CORP. Experimental Box- Knack of Knots by HABA USA/HABERMAASS CORP. Arranging Game Corner to Corner by HABA USA/HABERMAASS CORP. 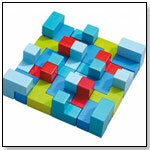 Corner to Corner is a set of beautifully colored tiles with varied building possibilities. The set includes several designs, such as a sailboat and a house, for children to recreate. Though the set includes a small number of blocks for its price, it is high quality and can be used to create complicated three-dimension cubes and pyramids. The tiles can be arranged in a flat pattern or upright, thus generating new results each time.